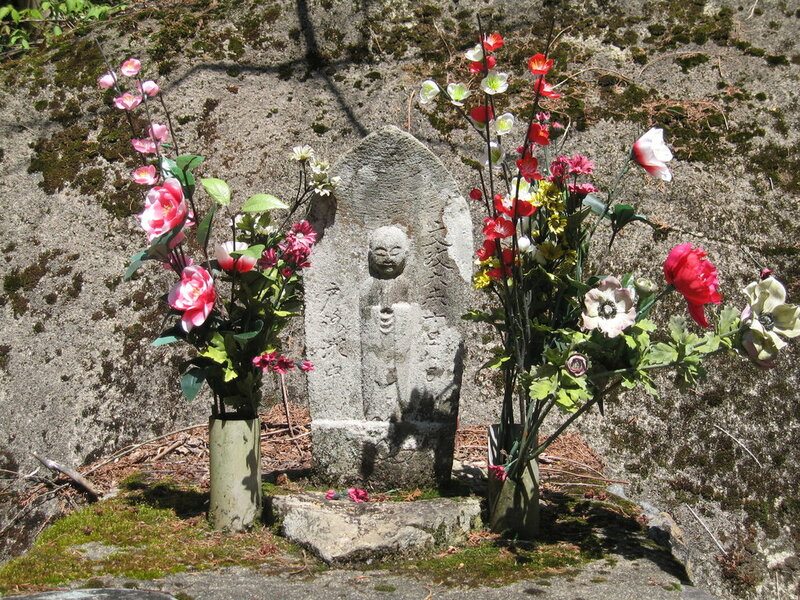 A "Jizo" Buddha at the pass on many country roads. Beautiful day in Golden Week, and we took the road above the house up the hill, past the “Jizo” at the pass, down a bit and took this little road off to the left. More a track really, with an almost obliterated sign pointing to a village we hadn’t heard of. About a 20-minute walk though cedar plantations later we arrived at this “village”: three buildings drowning in the forest. A few years ago people lived there, in these rather nice traditional wooden houses, growing rice in paddy fields nearby, now planted with cedars or spruce which have grown up all around. A footpath, still usable, led up the side of the hill from those houses to, we calculated, the next village a kilometre or so away. Just above was a little shrine with a couple of Buddha statues, an empty sake bottle and some flowers which were still fresh, so someone must have visited in the last day or two. A bit further on, down a slope, and sure enough there was the village, basking in the Spring sunshine. 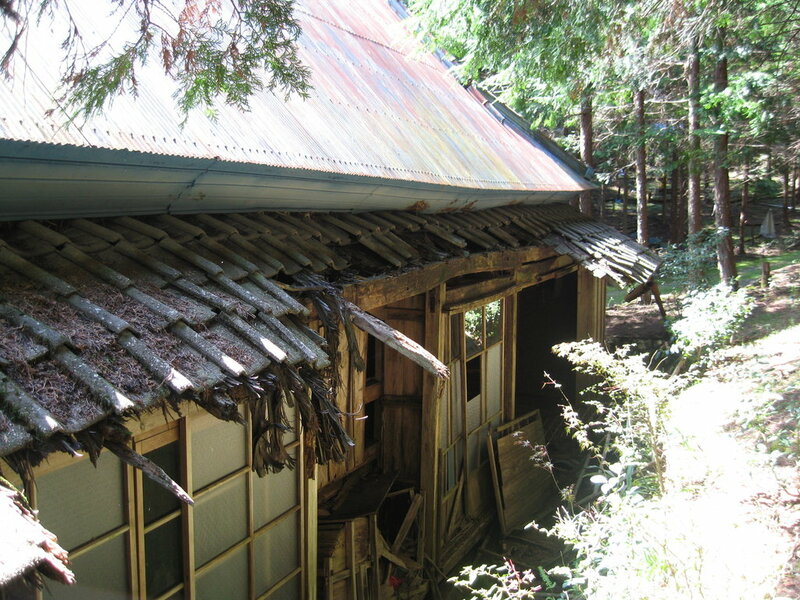 An image of rustic tranquillity. Really, quite beautiful, but so quiet. There is only a handful of people living there now, all getting on in years. Children have moved out into the cities to get jobs in offices and factories, leaving their parents tending the ricefields and cows in this corner of paradise. As it happens, we know a couple of the people here. The couple who live at the top looked after our house – opening the windows to let the breeze though once in a while, bit of weeding etc – while we were in Thailand for a year. Further down the road we ran into Hashimoto san, who must be 70 or so by now; he keeps some cows and grows rice. I wonder what it will be like in 10 or 15 years when most of these people have passed on? Will there be a u-turn from the city, a boom in eco-living… or will this idyllic village go the way of those houses in the woods?